In this article, we’ll describe an experiment we ran during the Summer : we used Repost, our content distribution tool, to automate the social distribution of my wife’s Blog. It’s a early case-study of a strategy that lead to nearly 5K visitors over a month, without doing anything. Half of her traffic came from the tool during the Summer ! I am a huge fan of Inbound.org community. 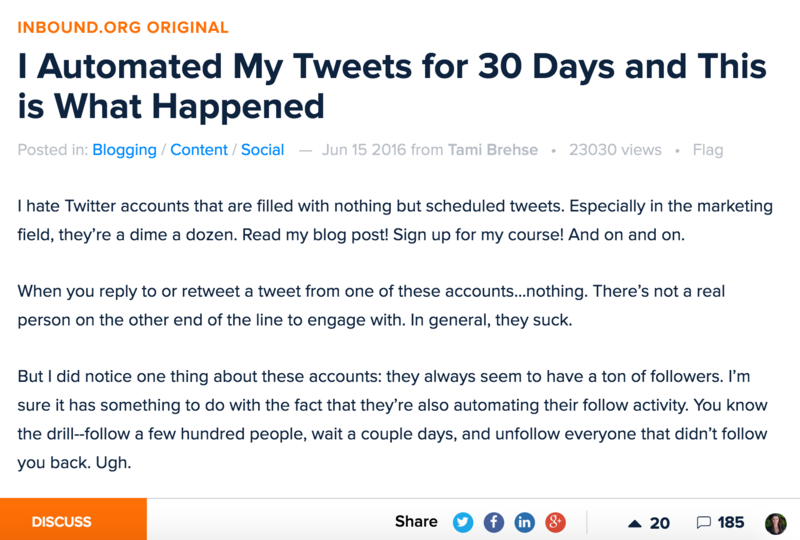 A while ago, we noticed a post by Tami Brehse (@tamibrehse) titled “I Automated My Tweets for 30 Days and This is What Happened“. I was immediately attracted by the post because it described an experiment Tami was doing manually, and that she could have done with the tool we were developing at the time. Tami didn’t know about Repost by Elokenz of course, and she did the automation very simply, putting her posts in Buffer, and rescheduling them with a given interval. Her results were already impressive , and a very active discussion started. When she described the result of her experiment, Repost was just released as a private beta. But Tami’s post was so motivating for me that I decided to duplicate the same experiment on a blog my wife is running. My wife completely automated the social media distribution for 30 days. She kept interacting on her social media communities and kept blogging once a week. However she never shared one of her post manually during this experiment. Her results were outstanding. She managed to get 50% of her traffic (which is 5000 out of a total of 9800 Unique Visitors) from the automatic distribution. We published a French blogpost at the time, and now that Elokenz is getting more international, I decided to adapt the original post to English. Now that you know a little bit how Repost works, I wanted to give you an impressive case study. To test early performances, I gave the tool to my wife to be used on one of her Blog. The blog is about Pets and has a rather big Facebook fan-page (32K followers) and a smaller one on Twitter (150 followers). Before trying Repost, the website had about 6K unique visitors per month. She added 21 articles to be reposted on Facebook and Twitter. She probably spent about 2 hours to create different messages for the various articles. Now, when she adds an article on the website, she also creates a Repost with different messages, and the tool then takes care of sharing the article on her Facebook page and Twitter account. She now uses her time to write new articles and manage the social media community (curation or moderation). From time to time the tool reposts articles that resonated a lot in the past and it goes viral again (it happens about once or twice a month). In order to get accurate stats, I created up a Google Analytics Dashboard linked to Repost (you can download and use it too to see how Repost performs for you). We can see that in spite of the size of the Twitter community and the fact that Twitter is a fast-paced social media platform, my wife gets 25% of her Repost traffic via this social media. Some tweets probably got retweeted by some influential accounts. So, during the 30 days, the website had 4 900 visitors via Elokenz Repost. This came with close to no effort, just the initial 2 hours used to configure messages for each social media. The website doesn’t have many backlinks and the SEO is neither good nor bad (2 000 unique visitors per month come from Google). This actually means that about 50% of the traffic came from our reposts ! I am not going to provide statistics about the Facebook page because it has been target of numerous actions and it wouldn’t give useful informations. However, on Twitter, nothing else was done, except publishing Reposts from Elokenz. The Twitter account received 13 new followers over the last 90 days. Not much but it still is a 10% increase over a trimester. It’s a good start ! The traffic did not grow to that point instantly. It took almost two months to get to an impressive several thousand visits per month. By using this, she gets much motivation from a living and enthusiastic Facebook community. This gives her extra boost for the weekly post on her blog. Since the tool share her blogpost for her, she can really focus on social/writing tasks. To be fair, the traffic is not that large every month. It depends on the articles Repost will share (and we didn’t want the tool to share only the same posts over and over, so this is normal). Facebook reach also played a big part. Since this is somehow our first case-study, we don’t have much hindsight. If you are reposting old content automatically (whatever the tool), what are the result you usually get ? If you use Repost, you can try our Google Analytics Dashboard to get a feeling of your results. Otherwise, you might have to set a few goals/segments in GA.
You can discover why we created Repost in this post : Repost working principles and philosophy. A massive “Thank you” to Fanny who translated almost all this post from French to English.